KAMPALA– Prof. William Bazeyo, the acting Deputy Vice Chancellor (Finance and Administration) at Makerere University over the weekend was awarded for his excellent works in the private and public sector. This all happened during a colorful ceremony held at Protea Hotel, Kampala on Saturday, November 3. Prof Bazeeyo emerged both the country and regional winner of the Great Lakes 2018/2019 CEO Global Pan African Awards for Africa’s Most Influential Women in Business and Government, and Titans-Building Nations after a competitive vetting process. The awards are the leading Pan African recognition programme honouring excellence in the private and public sector. The programme covers 23 economic sectors and has for close to two decades independently recognized those leaders who are at the pinnacle of their industry. Under the Titans Programme: Building Nations, Prof. Bazeyo was recognized for his outstanding achievements in education and training sector in Africa. Prof. Bazeyo’s career and life journey is an embodiment of an individual who has generously shared his knowledge and skills to make a difference in the lives of other people. Prof. Bazeyo has significantly contributed to the transformation of the region through research, nurturing upcoming innovators, mentoring students, resource mobilization for Africa, winning multi-million dollar projects and so much more. As the Chief of Party at the ResilientAfrica Network (RAN), he manages a US$25million project that is nurturing and working with upcoming innovators in 20 Universities to find solutions to challenges facing Africa. The regional award sets the platform for Prof. Bazeyo, to compete in the continental awards scheduled to take place in the last week of November 2018 in South Africa. All regional winners from West Africa, East Africa and South Africa will be evaluated again to select the Continental winners in different categories. “To be recognized as a continental finalist is an achievement in its own right. 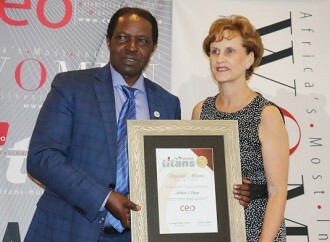 You are without a doubt on the right path and we hope the recognition you have enjoyed spurs you on to greater things,” remarked Annelize Wepener, Chief Executive Ofdicer of CEO Global, Annelize Wepener. The continental winners will be afforded the opportunity to join the “Network of Influence”, which will give them access to developmental tools, investment opportunities and serve as a platform to bring together small and medium enterprises within the corporate and the public sector. The outgoing Kampala Capital City Authority (KCCA) Executive Director, Mrs. Jennifer Semakula Musisi won the Country Award under the agencies and regulatory authority category at the same occasion.